We fabricated the raptor skeleton with the help of EnRoute and our new plasma cutter from MultiCam a while back. The permanent placement had to wait for good weather. With the return of summer lately we are getting started on finishing a little more landscaping around the yard. A few weeks ago we prepped the ground and rolled out some turf. It sure cleaned things up in a hurry. 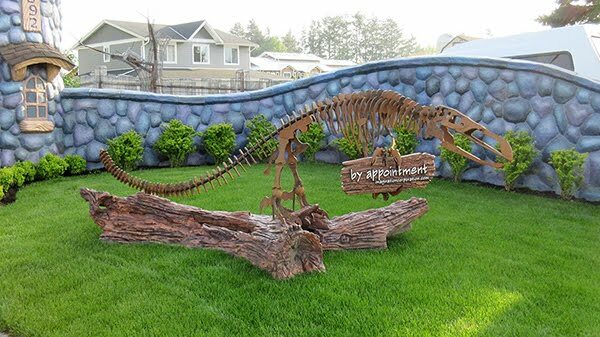 Once the grass was down we could do a final install on the dinosaur sign. The rust patina has really evened out over the winter months and it is looking pretty fine! I’ll cut in a flower bed around it in a week or two when it is time to plant the annuals. Will it encourage the look-loos to make an appointment before coming on our property? I doubt it but it does finish off the area beside the driveway very nicely.